Michal M. "Michael" Scheidel Jr. was born May, 1818, in the Town of Grittvil, Alsace-Lorraine, France, and died August 7, 1894, at his residence in Byron Twp., Fond du Lac Co., WI, at age 78. Buried in Byron Cemetery, Byron Twp., Fond du Lac Co., WI. He is the son of Michal M. Scheidel Sr. of Croettwiller, Bas-Rhin, Lorraine, France, and Catharina "Ann?" Gunter of Alsace-Lorraine, France. Elizabeth Lyon was born March 17, 1823, in New Jersey, and died May 24, 1867, in Byron Twp., Fond du Lac Co., WI, at age 44. Buried in Byron Cemetery, Byron Twp., Fond du Lac Co., WI. She is the daughter of Unknown Lyon of Germany. Michal Scheidel arrived April 20, 1837, at the Port of New York, United States, from LeHavre, France, aboard SS Burgundy. Michal M. Scheidel Jr. and Elizabeth Lyon were married April 3, 1842, in Morris Co., NJ. John Lyon Shidell: Born February 11, 1846, in Rockaway Twp., Morris Co., NJ; Died August 8, 1922, at his home in the City of Sparta, Monroe Co., WI (age 76). Buried in Woodlawn Cemetery, Sparta, Monroe Co., WI. Married May 10, 1867, at the Methodist Episcopal Church, Byron, Fond du Lac Co., WI, to Ellen J. Willson: Born January, 1851, in Oakfield Twp., Fond du Lac Co., WI; Died March 6, 1942, at Wisconsin Veteran's Home, King, Waupaca, Waupaca Co., WI (age 91). Buried in Woodlawn Cemetery, Sparta, Monroe Co., WI. Elizabeth Shidell: Born June 4, 1847, in Rockaway Twp., Morris Co., NJ; Died August 4, 1847, in Rockaway Twp., Morris Co., NJ (age Infant). Buried in Rockaway Cemetery, Morris Co., NJ. Anna Maria Shidell: Born June 2, 1850, in Rockaway Twp., Morris Co., NJ; Died June 4, 1851, in Rockaway Twp., Morris Co., NJ (age 1). Buried in Rockaway Cemetery, Morris Co., NJ. Mary Shidell: Born May 3, 1854, in Byron Twp., Fond du Lac Co., WI; Died May 24, 1914, in the Village of Kasson, Mantorville Twp., Dodge Co., MN (age 60). Married October 3, 1871, in Byron Twp., Fond du Lac Co., WI, to Newton E. Beard: Born October 28, 1853, in Ashford, Fond du Lac Co., WI; Died May 11, 1926, in the Village of Kasson, Mantorville Twp., Dodge Co., MN (age 72). James Shidell: Born July 9, 1856, in Byron Twp., Fond du Lac Co., WI; Died March 29, 1857, in Byron Twp., Fond du Lac Co., WI (age Infant). Buried in Byron Cemetery, Byron Twp., Fond du Lac Co., WI. Frank Shidell: Born February 1858 in Byron Twp., Fond du Lac Co., WI; Died February 15, 1859, in Byron Twp., Fond du Lac Co., WI (age 1). Buried in Byron Cemetery, Byron Twp., Fond du Lac Co., WI. William Shidell: Born June, 1861, in Byron Twp., Fond du Lac Co., WI; Died May 24, 1862, in Byron Twp., Fond du Lac Co., WI (age Infant). Buried in Byron Cemetery, Byron Twp., Fond du Lac Co., WI. 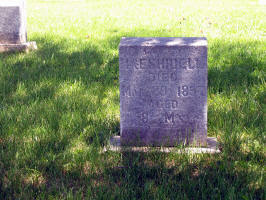 Elizabeth (Lyon) Shidell died May 24, 1867, in Byron Twp., Fond du Lac Co., WI, at age 44. Following Elizabeth (Lyon) Shidell's death, Michal M. "Michael" Scheidel Jr. a widower, married a widow, Anna H.(Worthing) Willson. Anna H. Worthing was born April 22, 1822, in Wales, and died January 31, 1916, in Sparta, Monroe Co., WI, at age 93. Buried in Avoca Cemetery, Oakfield, Fond du Lac Co., WI. She is the daughter of William Worthing of County Radnor, Wales, and Margaret Davis of County Bercknock, Wales. Joseph Willson was born April 2, 1810, in New York, and died October 15, 1867, in Fond du Lac Co., WI, at about age 57. Buried in Avoca Cemetery, Oakfield, Fond du Lac Co., WI. Joseph Willson and Anna H. Worthing were married 1850 in Salem, Walworth Co., WI. Ellen J. Willson: Born January, 1851, in Oakfield Twp., Fond du Lac Co., WI; Died March 6, 1942, in Waupaca, Waupaca Co., WI, (age 91). Buried in Woodlawn Cemetery, Sparta, Monroe Co., WI. Married May 10, 1867, in Fond du Lac Co., WI, to her step-brother, John Lyon Shidell: Born May 10, 1846, in Rockaway Twp., Morris Co., NJ; Died August 8, 1922, at his home in Sparta, Monroe Co., WI (age 76). Buried in Woodlawn Cemetery, Sparta, Monroe Co., WI. Sarah E. Willson: Born January 2, 1853, in Oakfield Twp., Fond du Lac Co., WI; Died March 5, 1853, in Oakfield Twp., Fond du Lac Co., WI (age Infant). Buried in Avoca Cemetery, Oakfield, Fond du Lac Co., WI. Michal M. "Michael" Scheidel Jr. and Anna H. (Worthing) Willson were married December 6, 1868, in the parsonage of the Methodist Episcopal Church, Byron Corners, Fond du Lac Co., WI. Michal M. "Michael" Scheidel Jr. and Anna H. (Worthing) (Willson) Shidell had no children. Shidell family Bible photos courtesy of Richard Schoonover Thorn of Minnesota. Joseph Willson was born April 2, 1810, in New York. Michael M. "Michael" Scheidel Jr. was born May 1818 in the Town of Grittvil, Alsace-Lorraine, France. Elizabeth Lyon was born March 17, 1823, in New Jersey. Anna H. "Ann" Worthing was born April 22, 1822, in Wales. Michel Scheidel (age 19), a Farmer, departed April 20, 1837, from Havre De Grace, aboard the Ship Burgundy, and arrived April 20, 1837, in the Port of New York. The 1840 U. S. Census shows an Elizabeth Lyon (age 50 to 60), probably a widow, living in Hanover Twp., Morris Co., NJ. There are two males and two additional females in the household. About three houses away is Edward D. Shidle (age 20 to 30) with a wife? (age 20 to 30), and a son? (under age 5). Note: the handwriting of Shidle looks like Stickler. Elizabeth was also listed in the 1830 census, without a husband at home. The 1840 U. S. Census shows an Elizabeth Lyon (age 50 to 60), probably a widow, living in Hanover Twp., Morris Co., NJ. There are two males and two additional females in the household. Elizabeth was also listed in the 1830 census, without a husband at home. Elizabeth Lyon (age 75) was also listed in the 1850 census, living alone. Michal M. "Michael" Scheidel Jr. and Elizabeth Lyon were married April 3, 1842, in Morris Co., NJ. 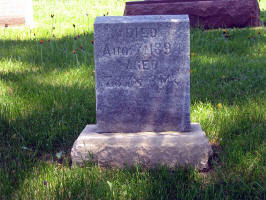 Joseph Willson and Ann Worthing were married 1850 in Salem, Kenosha Co., WI. The 1850 U. S. Census taken on August 9, 1850, shows Michael Shidle (age 28) a Laborer born in Germany is living in Rockaway Twp., Morris Co., NJ. Living with him is Elisabeth Shidle (age 23) born in New Jersey. Also living there is John Shidle (age 4) born in New Jersey. Leigh Larson note: There was the John Lyon family living nearby. It is likely that Elizabeth is related to the Lyon family: John Lyon (age 32) is a Farmer born in New Jersey, with wife Mary Lyon (age 33) and four daughters and one son, all born in New Jersey. The 1850 U. S. Census taken on September 24, 1850, shows Joseph Wilson (age 40) born in New York with real estate of $1,400 is a House Carpenter and is living in Salem Twp., Kenosha Co., WI. Living with him are: Ann Wilson (age 28) born in Wales; Jane Wilson (age 12) born in Massachusetts; and Debora Wilson (age 71) born in New Hampshire. The 1855 Wisconsin State Census taken on June 1, 1855, shows Michael Shidell is living in Byron Twp., Fond du Lac Co., WI. There are a total of 2 Males and 2 Females, with 1 of foreign birth. The 1860 U. S. Census taken on July 23, 1860, shows Michael Shidle, Jr. (age 41) born in Saxony with Real Estate of $2,500 and Personal Estate of $629 is a Farmer and is living in Byron Twp., Fond du Lac Co., WI. Living with him is his wife Elizabeth Shidle (age 38) born in New Jersey. Also living there are their children: John Shidle (age 13) born in New Jersey; and Mary Shidle (age 5) born in Wisconsin. The 1860 U. S. Census taken on July 7, 1860, shows Joseph Wilson (age 59) born in New York with real estate of $2,500 and personal estate of $50 is a Farmer and is living in Leroy Twp., Dodge Co., WI. Living with him is Ann Wilson (age 38) born in England. Also living at home are: Anna G. Wilson (age 9); and Wm. H. Wilson (age 6), both born in Wisconsin. Ellen married her stepbrother, John Lyon Shidell, son of Michael Shidell Jr., on May 10, 1867. He became her stepbrother after her mother's second marriage. 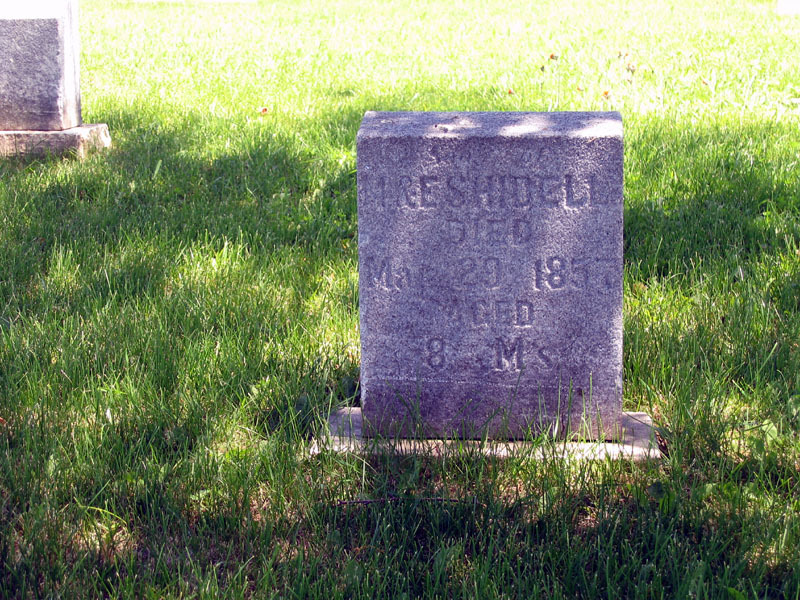 Elizabeth (Lyon) Shidell died May 24, 1867, in Byron Twp., Fond du Lac Co., WI, at age 44. Buried in Byron Cemetery, Byron Twp., Fond du Lac Co., WI. 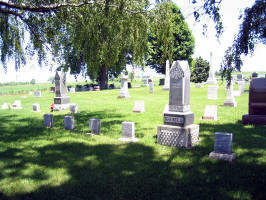 Joseph Willson died October 15, 1867, in Fond du Lac Co., WI, at about age 66. Buried in Avoca Cemetery, Oakfield, Fond du Lac Co., WI. Michael M. "Michael" Scheidel Jr. and Ann (Worthing) Willson were married December 6, 1868, in the parsonage of the Methodist Episcopal Church, Byron Corners, Fond du Lac Co., WI. The 1870 U. S. Census taken on June 10, 1870, shows Michael Shidall (age 52) born in Alsace, France, with real estate of $4,800 and personal estate of $550 is a Farmer and is living in Byron Twp., Fond du Lac Co., WI. Living with him is Angell Shidall (age 45) born in England, who is Keeping House. Also living there are: Wm. H. Wilson (age 16) born in Wisconsin, a Farm Laborer; and Mary Shidall (age 16) born in Wisconsin, who is Keeping House. The 1870 U. S. Census taken on June 10, 1870, shows John Shidall (age 24) born in New Jersey with real estate of $4,000 and personal property of $400 is a Farmer and is living in Byron Twp., Fond du Lac Co., WI . Living with him is Ellen J. Shidall (age 19) born in Wisconsin, who is Keeping House. The 1870 U. S. Census taken on June 24, 1870, shows Christena Griffa (age 52) born in Prussia, is a Head of Household who is Keeping House, and is living in the 4th Ward, City of Oshkosh, Winnebago Co., WI. Living with her are: Rufus Griffa (age 24) born in Prussia, a Blacksmith; Malinda Griffa (age 18) born in Prussia, who Works in a Shingle Mill; Lydia Griffa (age 14) born on the ocean coming from Prussia, who Works in a Shingle Mill; and Hannah Griffa (age 12) born in Wisconsin. 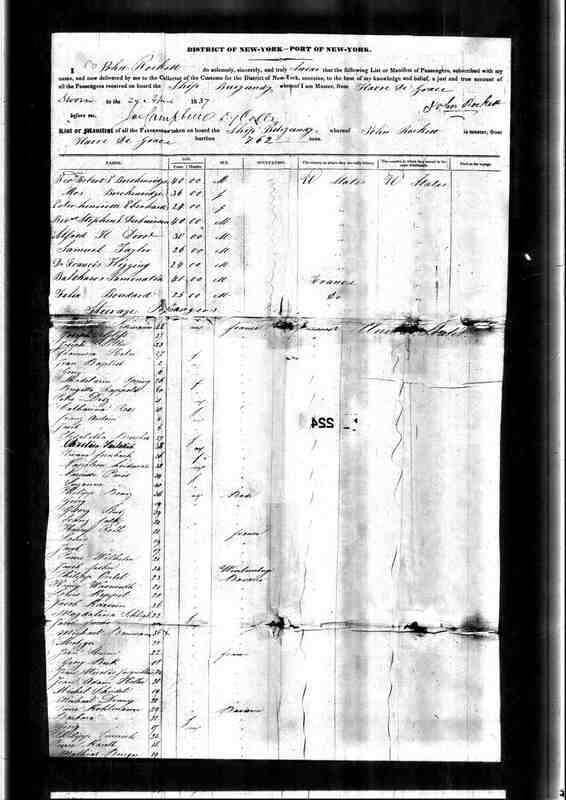 The 1875 Wisconsin State Census taken on June 1, 1875, shows Michael Shidall is the Head of Household and is living in Byron Twp., Fond du Lac Co., WI. Living in the household are a total of 2 Males and 2 Females. The 1880 U. S. Census taken on June 21, 1880, shows Michael Shidell (age 62) born in Alsace to Alsace-born parents is a farmer living in Byron Twp., Fond du Lac Co., WI. Living with him is his wife Ann Shidell (age 58) born in Wales to Welsh-born parents. Two servants also live in the house: a male laborer (age 19) and a female domestic (age 17). The 1880 U. S. Census taken on June 14, 1880, shows William Wilson (age 26) born in Wisconsin to Connecticut and English-born parents, is a married Physician and is living in Byron Twp., Fond du Lac Co., WI. Living with him are: his wife, Margaret Wilson (age 23) born in Wisconsin to Ohio and English-born parents, who is Keeping House; and his son, Harry Wilson (age 1) born in Wisconsin to Wisconsin-born parents. The 1880 U. S. Census taken on June 10, 1880, shows Apha Voorhes (age 27) born in Ohio to Ohio-born parents is a married Farmer and is living in Woodland Twp., Sauk Co., WI. Living with him is his wife, Malinda Voorhes (age 27) born in Germany to German-born parents, who is Keeping House. The 1885 Wisconsin State Census taken on June 20, 1885, shows Michael Shidell is the Head of Household and is living in Byron Twp., Fond du Lac Co., WI. Living in the household: 2 Males, 2 Females. Of these, 1 born in the United States, 2 born in Germany, and 1 born in Great Britain. 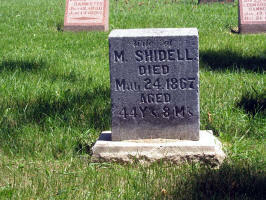 Michal M. "Michael" Scheidel Jr. died August 7, 1894, at his residence in Byron Twp., Fond du Lac Co., WI, at age 78. Buried in Byron Cemetery, Byron Twp., Fond du Lac Co., WI. The 1900 U. S. Census taken on June 1, 1900, shows Ann Shiddell (age 75) born April 1825 in England to English-born parents is a boarder living Sparta, Sparta Twp., Monroe Co., WI. She is a widow married for 28 years and both of her children are living. She emigrated from England in 1850 and is living in the household of John L. Shiddell (age 52) born February 1848 in New Jersey of New York and German-born parents) who is a photographer who owns his own house and has been married for 25 years. Living with him is his wife Ellen J. Shiddell (age 44) born January 1856 in Wisconsin of New York and English-born parents. Ellen is childless. The 1900 U. S. Census taken on June 1, 1900, shows William H. Willson (age 46) born January, 1854, in Wisconsin to Vermont and English-born parents is a widower Physician who rents his home, and is living at 494 Main Street, 2nd Ward, City of Fond du Lac, Fond du Lac Co., WI. Living with him is his unmarried son, Harry S. Willson (age 21) born July, 1878, in Wisconsin to Wisconsin-born parents, a Bookkeeper. The 1910 U. S. Census taken on April 21, 1910, shows Harry S, Wilson (age 31) born in Wisconsin to Wisconsin-born parents, and in his first marriage, is a married Head of Household, who is renting his home, and is in Fond du Lac Twp., Fond du Lac Co., WI. Living with him are: his childless wife of 7 years, Frances Wilson (age 40) born in Wisconsin to German-born parents; and his divorced father, William H. Wilson (age 57) born in Wisconsin to United States and Scottish-born parents, who has his Own Income. The 1910 U. S. Census taken on May 9, 1910, shows John L. Shidell (age 63) born in New Jersey to Unknown and New Jersey-born parents is a Photographer who owns his own home at 414 S. Water Street, 4th Ward, City of Sparta, Monroe Co., WI. Living with him is his wife of 42 years, Ellen J. Shidell (age 30) born in Wisconsin to New York and Wales-born parents, who is childless. Also living there is John's widowed mother-in-law, Ann W. Shidell (age 88) born in Wales to England and Wales-born parents. Ann (Worthing) (Willson) Shidell died January 31, 1916, in the City of Sparta, Monroe Co., WI, at age 93. Buried in Avoca Cemetery, Oakfield, Fond du Lac Co., WI. SPARTA, Wis., Feb. 3. - Mrs. Ann H. Wilson died at the home of her daughter, Mrs. John Shidell, on South Water street on Monday evening about seven o'clock from old age. Besides the daughter, she is survived by a son, Dr. W. H. Wilson, who has been in this city for several months to help care for his aged mother. There will be private services at the home this afternoon, and then Dr. Wilson will accompany the remains to the former home at Oakfield, Wis., where funeral services will be held and she will be buried by the side of her late husband. Mrs. Ann Worthing Willson Shidell, for many years a resident of Byron township, died at 7 o'clock Monday evening at the home of her daughter, Mrs. John L. Shidell, at Sparta. Beside her daughter she leaves one son, Dr. W. H. Willson, of this city; one grandson, Harry S. Willson, also of this city; one brother, James Worthing, of Fond du Lac; and many nephews and nieces, members of the several Worthing families of this city and Oakfield. 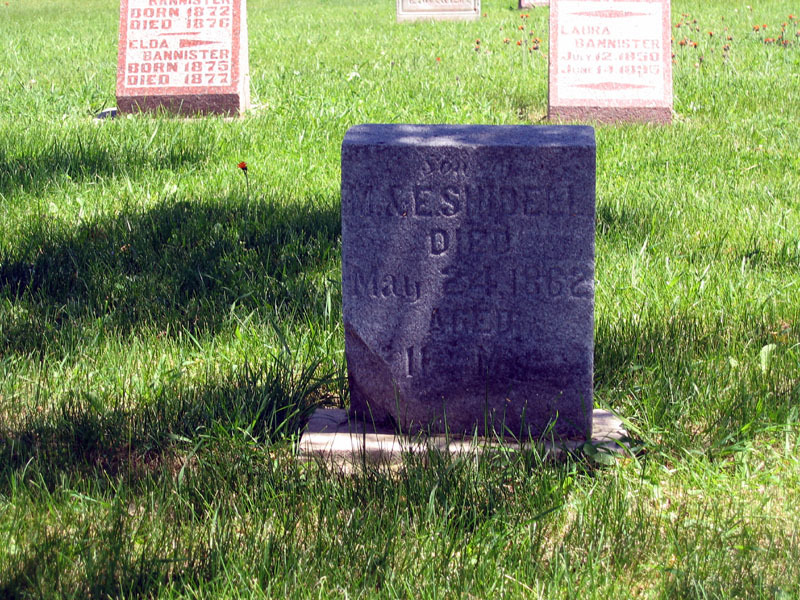 Mrs. Shidell is one of the pioneer residents of Leroy, Dodge county. She then resided in Byron township for many years until about fifteen years ago, when she went to Sparta to reside with her daughter. Funeral services will be held at the Methodist church at Oakfield at 10:30 Thursday morning. Burial will be in the Avoca cemetery, beside her first husband, Joseph Willson, who died in October, 1867. The bearers will be E. P. Worthing, of this city, Charles Taylor, Frank Barbee and Frank Worthing, all of Oakfield. The body will be accompanied to Oakfield by Dr. W. H. Willson. The daughter, Mrs. Shidell, will be unable to attend the funeral as she recently fractured her knee cap in a fall on a slippery walk. The 1920 U. S. Census taken on January 13, 1920, shows Harry S, Wilson (age 41) born in Wisconsin to Wisconsin-born parents, is a married Bookkeeper in an Office who owns his home with a mortgage, and is living at 323 East Division Street, 12th Ward, City of Fond du Lac, Fond du Lac Co., WI. Living with him are: his wife, Francis Wilson (age 40) born in Wisconsin to German-born parents; and his widower father, William H. Wilson (age 65) born in Wisconsin to Vermont and Wales-born parents, a Doctor of Medicine. The 1930 U. S. Census taken on April 14, 1930, shows Harry S, Willson (age 51) born in Wisconsin to Wisconsin-born parents, and first married at age 24, is a married Bookkeeper at an Auto Garage who owns his home worth $6,000 and is living at 323 East Division Street, 12th Ward, City of Fond du Lac, Fond du Lac Co., WI. Living with him are: his wife, Frances Willson (age 50) born in Wisconsin to German-born parents and first married at age 23; and his widower father, Henry W. Willson (age 76) born in Wisconsin to Vermont and Wales-born parents. William Henry Willson, MD, died October 18, 1932, in Fond du Lac, Fond du Lac Co., WI in Fond du Lac Co., WI (age 78). Buried in Avoca Cemetery, Oakfield, Fond du Lac Co., WI. The 1940 U. S. Census taken on April 25, 1940, shows Harry S, Wilson (age 61) born in Wisconsin, and 5 years ago was living in the Same House, and with 4 years of High School, is a married City Storekeeper for the City of Fond du Lac who owns his home worth $3,500 and is living at 327 East Division Street, 18th Ward, City of Fond du Lac, Fond du Lac Co., WI. Living with him is his wife, Frances S. Wilson (age 60) born in Wisconsin, and 5 years ago was living in the Same House, and with 8 years of School. Harry Sumner Willson died June 7, 1961, in Fond du Lac, Fond du Lac Co., WI, at age 82. 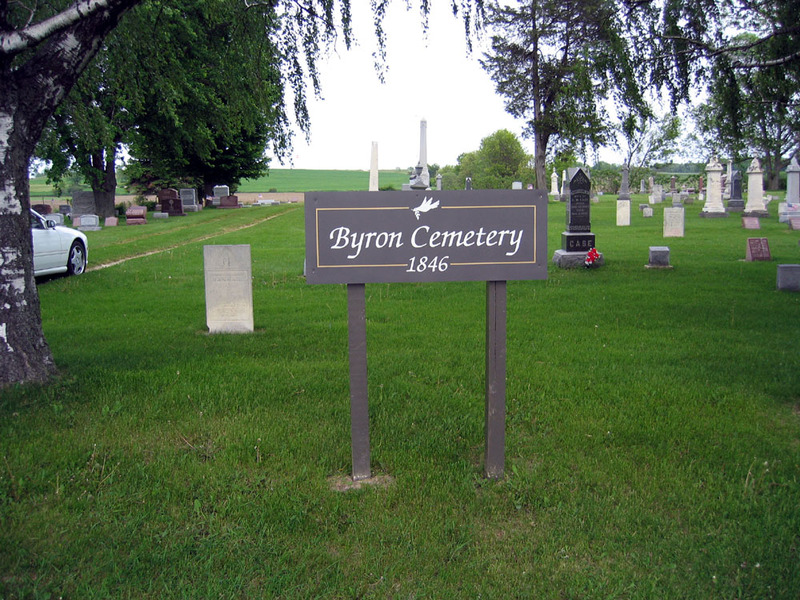 The Byron Cemetery is located just north of the unincorporated Village of Byron, Byron Twp., Fond du Lac Co., WI. Located in the Town of Byron, Fond du Lac Co., WI in Section 27, reached by taking Hwy. 175 south of Fond du Lac for a distance of about 5 miles. The cemetery is on the northern edge of the Village of Byron on the east side of the highway. The cemetery is well kept. Wellington Abbey and family members are also buried in this cemetery. The 1930 U. S. Census taken on April 14, 1930, shows Harry S, Willson (age 51) born in Wisconsin to Wisconsin-born parents, and first married at age 24, is a married Bookkeeper at an Auto Garage who owns his home worth $6,000 and is living at 323 East Division Street, 12th Ward, City of Fond du Lac, Fond du Lac Co., WI. Living with him are: his wife, Frances Willson (age 50) born in Wisconsin to German-born parents and first married at age 23; his widower father, Henry W. Willson (age 76) born in Wisconsin to Vermont and Wales-born parents; and an unmarried Lodger, George Gaiser (age 58) born in Germany to German-born parents, and having immigrated in 1883, and a Naturalized Citizen, a Mechanic at an Auto Garage.